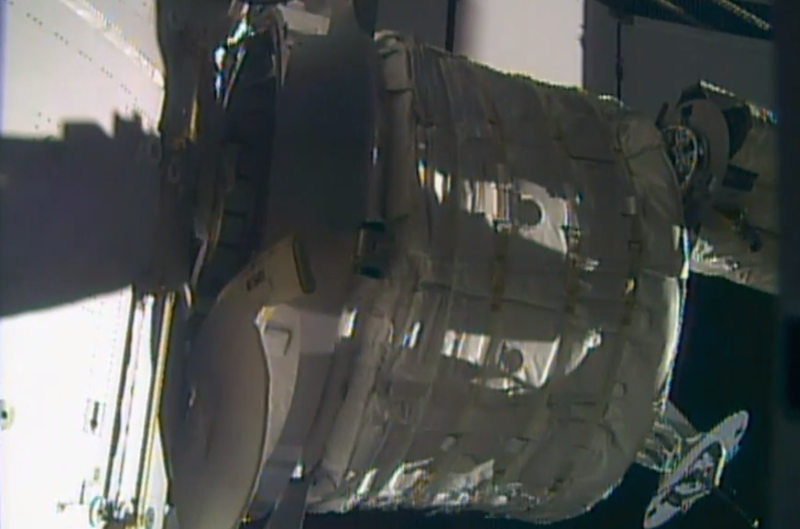 Following extraction from Dragon, the Bigelow Expandable Activity Module (BEAM) was installed to the International Space Station at 5:36 a.m. EDT. At the time of installation, the space station was flying over the Southern Pacific Ocean. It will remain attached to station for two-year test period. The Bigelow Expandable Activity Module, or BEAM, is attached to the International Space Station early on April 16, 2016. NASA is investigating concepts for habitats that can keep astronauts healthy during space exploration. Expandable habitats are one such concept under consideration – they require less payload volume on the rocket than traditional rigid structures, and expand after being deployed in space to provide additional room for astronauts to live and work inside. BEAM will be the first test of such a module attached to the space station. It will allow investigators to gauge how well it performs overall, and how it protects against solar radiation, space debris and the temperature extremes of space. In late May, BEAM will be filled with air and expanded to its full size. Astronauts will enter BEAM on an occasional basis to conduct tests to validate the module’s overall performance and the capability of expandable habitats. After the testing period is completed, BEAM will be released from the space station to eventually burn up harmlessly in the Earth’s atmosphere. This computer rendering depicts the Canadarm2 robotic arm removing BEAM from the back of the Space X Dragon spacecraft. BEAM, the Bigelow Expandable Activity Module, will be removed from the back of the SpaceX Dragon late tonight before installation on the Tranquility module begins early Saturday. Expansion of the new habitat module won’t occur until late May for two years of habitability tests. Meanwhile, the six-member Expedition 47 crew kept up its very busy pace of advanced space research this week to benefit life on Earth and crews in space. More eye checks were on the schedule today as scientists continued exploring vision changes astronauts have experienced while on orbit. The crew also observed skeletal muscle cells with a microscope to help researchers identify gravity sensors that may prevent muscle atrophy in space. Saliva samples were collected for a Japanese experiment analyzing how an astronaut’s immune system adapts to long-term space missions. The crew set up software for an experiment recording an astronaut’s cognitive performance during stressful conditions in space. They also answered questions about their station habitat providing insights to engineers to help them design spacecraft to meet the needs of future crews. The SpaceX Dragon approaches the International Space Station. The round solar array of the Orbital ATK Cygnus spacecraft is in the left foreground. The International Space Station will get a new module Saturday when the Bigelow Expandable Activity Module (BEAM) is removed from the SpaceX Dragon and installed on the Tranquility module. BEAM will be attached to the station for two years of tests before expandable modules become a permanent feature of future spacecraft. NASA and its international partners are using the station as an orbital laboratory to learn how the human body adapts to living and working in space. The wide variety of human research taking place on orbit today looked at work performance, vision, heart function, bones and muscles. British astronaut Tim Peake explored how astronauts perform detailed, interactive tasks using a touchscreen tablet for the Fine Motor Skills experiment. He also joined Commander Tim Kopra for eye checks as scientists study how the lack of gravity affects vision. NASA astronaut Jeff Williams scanned his legs with an ultrasound device for the Sprint exercise study and helped search for gravity sensors in cells to prevent muscle atrophy in space. Cosmonauts Alexey Ovchinin and Oleg Skripochka researched heart function so doctors can understand how the cardiovascular system adapts during different phases of a spaceflight. Veteran cosmonaut Yuri Malenchenko performed maintenance throughout the orbital lab’s Russian segment. He swapped out GoPro batteries and photographed the condition Zvezda service module panels. 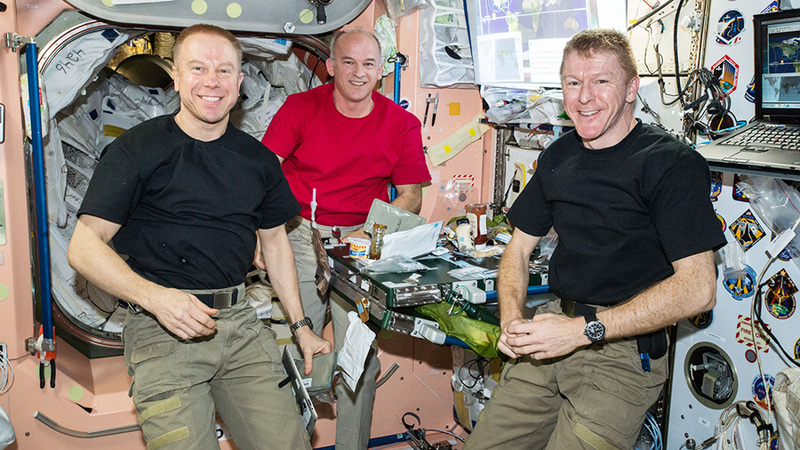 Expedition 47 crew members (from left) Tim Kopra, Jeff Williams Tim Peake eat dinner inside the Unity module aboard the International Space Station. The Expedition 47 crew has begun working new science delivered aboard the new Dragon and Cygnus commercial cargo ships. The crew is also getting ready for the extraction and installation of the Bigelow Expandable Activity Module scheduled for Saturday. One of the experiments delivered aboard Dragon is already being set up for operation. The Rodent Research-3 experiment is exploring an antibody used on Earth to see if it prevents muscle atrophy and bone loss in space. The crew is also working the Gecko Gripper study, launched aboard Cygnus, which is researching advanced adhesive technology. Commander Tim Kopra and British astronaut Tim Peake conducted vision tests and blood pressure checks today for the Ocular Health study. Scientists are researching vision changes reported during long-term space missions and how long before vision returns to normal when an astronaut returns to Earth. The International Space Station began a series of orbital boosts today to get ready for a June crew swap. Kopra and Peake along with fellow Expedition 46-47 crew member Yuri Malenchenko will return home in early June. They will be replaced about two weeks later when Expedition 48-49 crew members Anatoly Ivanishin, Kate Rubins and Takuya Onishi launch. The SpaceX Dragon cargo spacecraft was bolted into place on the Harmony module of the International Space Station at 9:57 a.m. EDT as the station flew 250 miles over southern Algeria. The spacecraft is delivering about 7,000 pounds of science and research investigations, including the Bigelow Expandable Activity Module, known as BEAM. Keep up with the conversation about the space station at www.nasa.gov/station or by following social media at @space_station and @ISS_research. While the International Space Station was traveling over the Pacific Ocean west of Hawaii, astronaut Tim Peake of ESA (European Space Agency), with the assistance of NASA’s Jeff Williams, successfully captured the SpaceX Dragon spacecraft with the station’s robotic Canadarm2 at 7:23 a.m. EDT. NASA TV coverage will resume at 9:45 a.m. for Dragon installation. 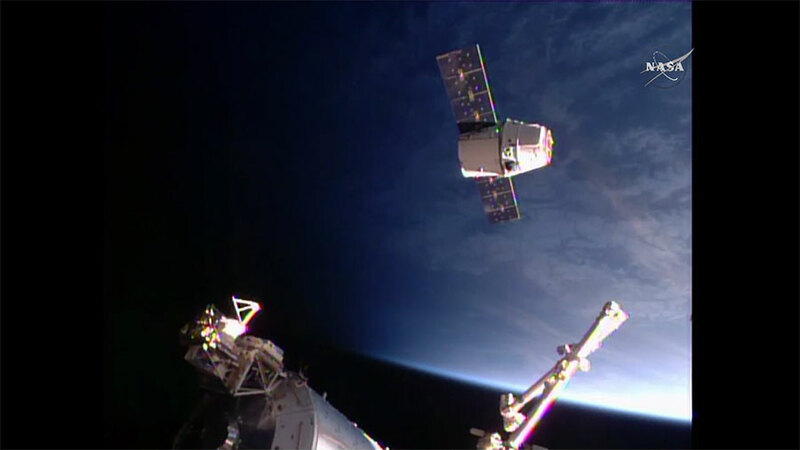 Dragon’s arrival marks the first time two commercial cargo vehicles have been docked simultaneously at the space station. Orbital ATK’s Cygnus spacecraft arrived to the station just over two weeks ago. 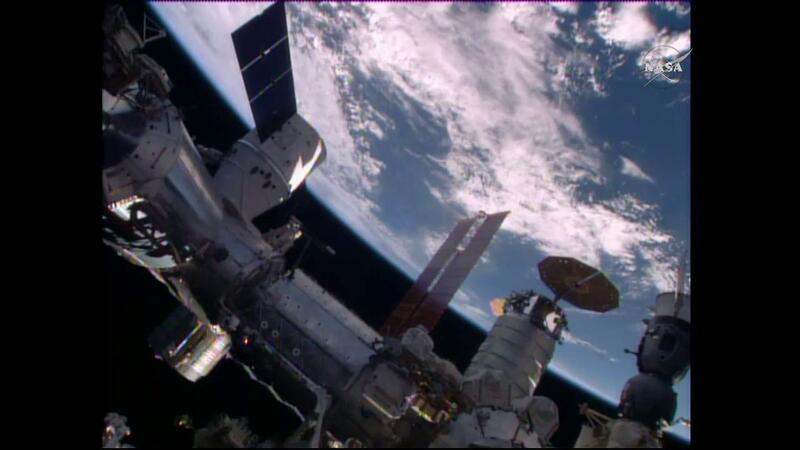 With the arrival of Dragon, the space station ties the record for most vehicles on station at one time – six. Join the conversation online by following @space_station and #Dragon. 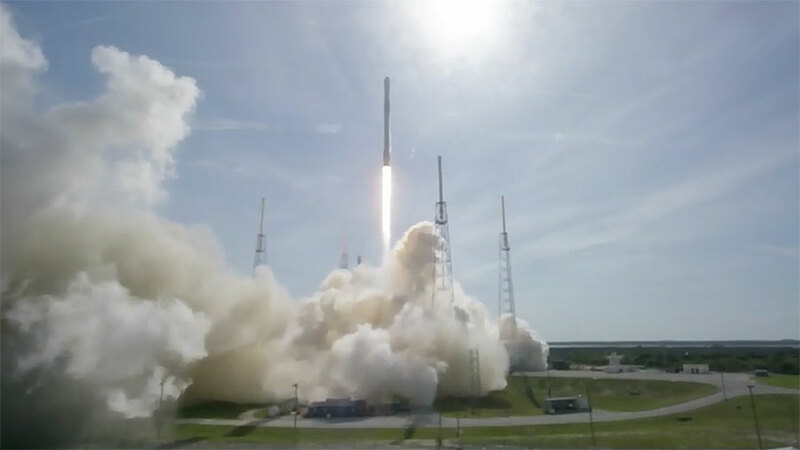 The SpaceX Falcon 9 rocket lifted off at 4:43 p.m. EDT, and Dragon has begun its journey to the International Space Station. Dragon separated from its second stage and achieved its preliminary orbit. Dragon’s solar arrays have deployed and will provide 5 kilowatts of power to the spacecraft as it begins a carefully choreographed series of thruster firings to reach the International Space Station. A post-launch news conference will air on NASA TV at 6 p.m. EDT. The spacecraft will arrive at the station Sunday, April 10, at which time ESA (European Space Agency) astronaut Tim Peake and NASA astronaut Jeff Williams will use the station’s robotic arm to capture the Dragon spacecraft. Ground commands will be sent from Houston to the station’s arm to install Dragon on the bottom side of the Harmony module for its stay at the space station. Live coverage of the rendezvous and capture will begin at 5:30 a.m. on NASA TV, with installation set to begin at 9:30 a.m.
For more information on the SpaceX CRS-8 mission, visit: https://www.nasa.gov/spacex. For more information about the International Space Station, visit: https://www.nasa.gov/station. To join the conversation online, use #Dragon. Weather forecasters have predicted a 90% percent chance of favorable conditions for the Friday launch of the SpaceX CRS-8 mission to the International Space Station. Launch of the Dragon resupply ship atop the Falcon 9 rocket is scheduled for 4:43 p.m. EDT/8:43 p.m. UTC from the Cape Canaveral Air Force Station in Florida. NASA Television will cover the launch and rendezvous activities live. British astronaut Tim Peake is training for the robotic capture of Dragon when it arrives Sunday morning carrying 6,900 pounds/3,130 kilograms of science, crew supplies and hardware. NASA astronaut Jeff Williams will back up Peake during the rendezvous and capture activities. 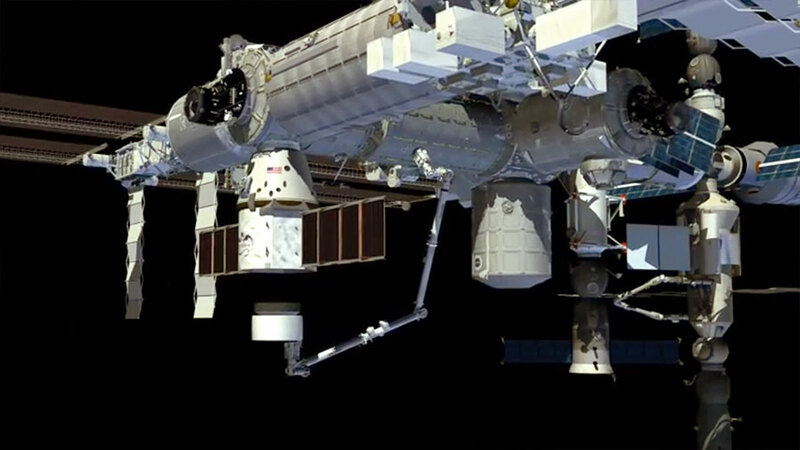 After Dragon is captured, ground controllers will take over the Canadarm2 robotic activities and remotely install the commercial space freighter to the Harmony module. The Expedition 47 crew is still working advanced space science setting up new experiments delivered March 26 on the Orbital ATK private cargo craft. The crew is also preparing for even more science being delivered aboard Dragon. The new experiments will explore muscles and bones, fluids at nano-scales and protein crystals. The research has the potential to help scientists design newer, more advanced drugs to improve health. 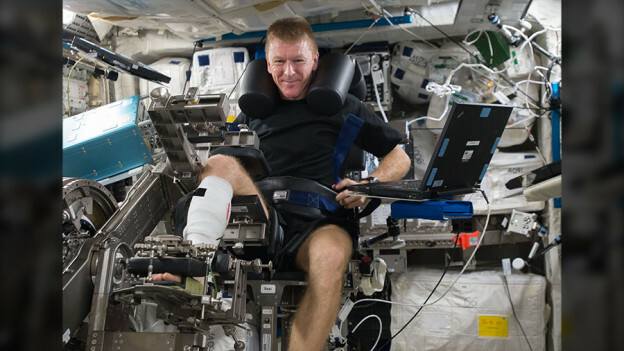 Astronaut Timothy Peake explores muscle health in space using the Muscle Atrophy Research and Exercise System. The crew periodically simulates emergencies at the space station to stay familiar with escape routes, safety hardware and communication protocols. Afterward, the astronauts and ground teams review the results to continuously improve space safety procedures. Muscle research has been taking place this week on the orbital lab with astronauts using a specialized exercise device. The Muscle Atrophy Research and Exercise System (MARES) helps scientists understand the effects of living in space on the human body. Another life science study today looked at how working in space affects a cosmonaut’s breathing rate. The crew also explored the stresses the space station experiences during events such as spacecraft dockings and engine firings. SpaceX is getting ready for the launch of its Dragon resupply ship Friday at 4:43 p.m. EDT/8:43 p.m. UTC. The crew is packing gear and training for Dragon’s Sunday arrival and robotic capture. NASA Television will cover the launch and rendezvous activities live. 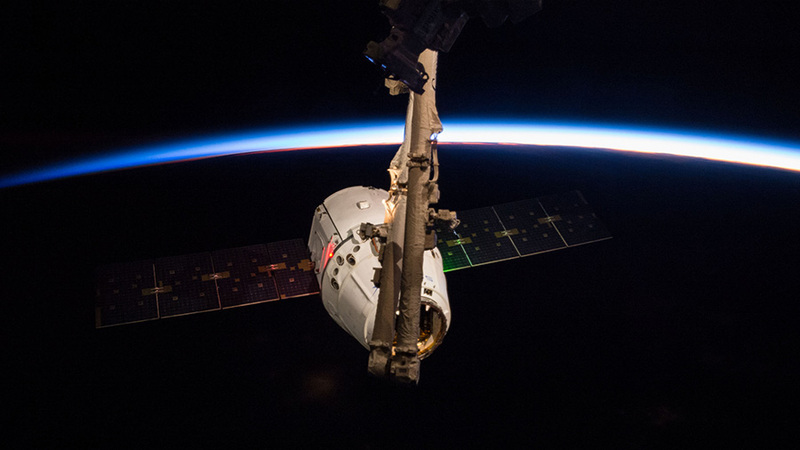 The SpaceX Dragon, on its CRS-5 mission, was captured January 12, 2015, during Expedition 42. The SpaceX Dragon CRS-8 mission will deliver 6,900 pounds/3,130 kilograms of science, crew supplies and hardware to the International Space Station. Payloads aboard Dragon will include rodents for a medical study and an expandable module that will be installed after Dragon completes its two-day trip to the station. 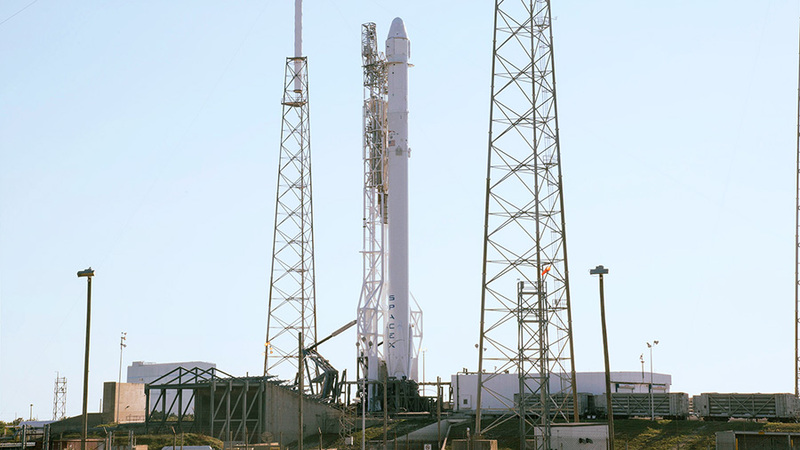 Dragon is scheduled for launch Friday at 4:43 p.m. EDT/8:43 p.m. UTC. It is scheduled to be captured with the Canadarm2 robotic arm Sunday at 7 a.m. and will be installed to the Harmony module about two-and-a-half hours later. The Expedition 47 crew is getting the Rodent Research hardware ready in the orbital lab so scientists can learn how to offset bone and muscle diseases on Earth. 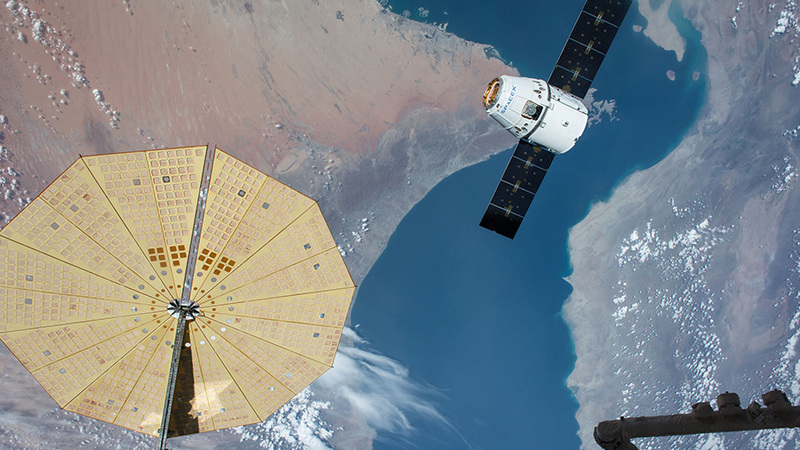 Researchers will be exploring how living in space affects bones and muscles by observing mice soon after Dragon arrives. The largest payload in Dragon is the Bigelow Expandable Activity Module (BEAM). The BEAM will be attached to the Tranquility module a week after its arrival for a series of habitability tests over two years. Astronaut Tim Peake continued more muscle research today using specialized exercise gear and attached electrodes to his right leg and ankle. Commander Tim Kopra is collected hardware for a combustion experiment that is studying more efficient ways to burn fuel on Earth and in space. Flight Engineer Jeff Williams is training for the new Meteor imaging experiment delivered aboard the Orbital ATK resupply ship.